Cape buffalo, one of the ‘big five’ of dangerous African game. Considered by some to be the most dangerous of African big game. Requiring a well-placed shot, these otherwise docile animals can become raging torrents of unstoppable aggression when angered or injured – almost 2000lbs of adrenaline fuelled, horned muscle heading towards you. Hunting these dangerous beasts is a thrill in its own right and makes for an exhilarating hunt indeed. Whilst in Africa, why not take advantage your time in this stunning country and combine your buffalo hunt with one of our other African hunts? We can combine hunting trips to ensure you get the most out of your visit. All accommodation and transfers can be arranged by Athina Sporting on your behalf upon request. Contact us for further information or to discuss your requirements. Unsure on big game rifle calibre and ammunition suitability? Contact us for advice! Cape buffalo bulls typically range from 38″ on average with the possibility of up to 43-45″ in width. Trophy animals are available. Athina Sporting offers hunting cape buffalo in the Limpopo region of South Africa. 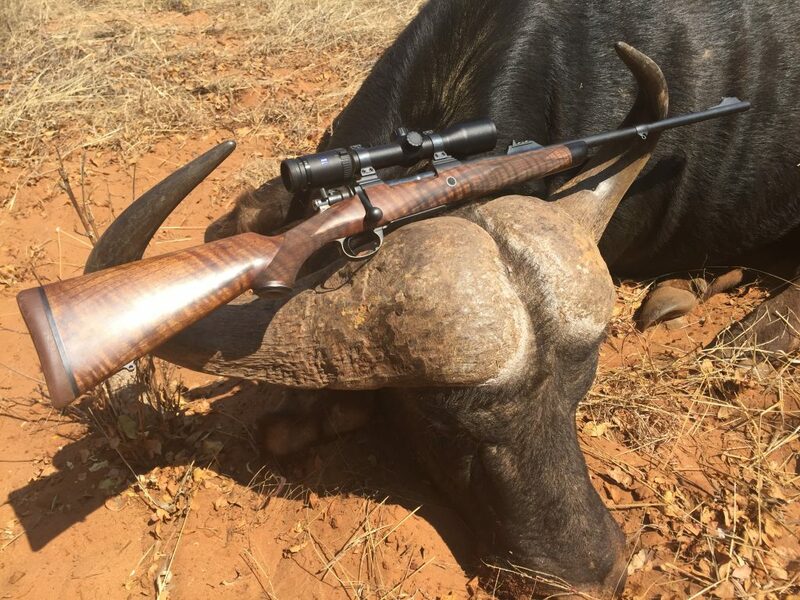 There are no seasonal restrictions on the hunting of cape buffalo in South Africa, so hunts are available year round to suit your requirements. Prices start at £9000 for buffalo hunt packages in South Africa. Please contact us for further information or for a quote on a comprehensive South African safari package.